The Hokkaido Milk Pie launched in Japan on 29 March 2016 as a part of a new "By McSweets" line of desert items across Japan. 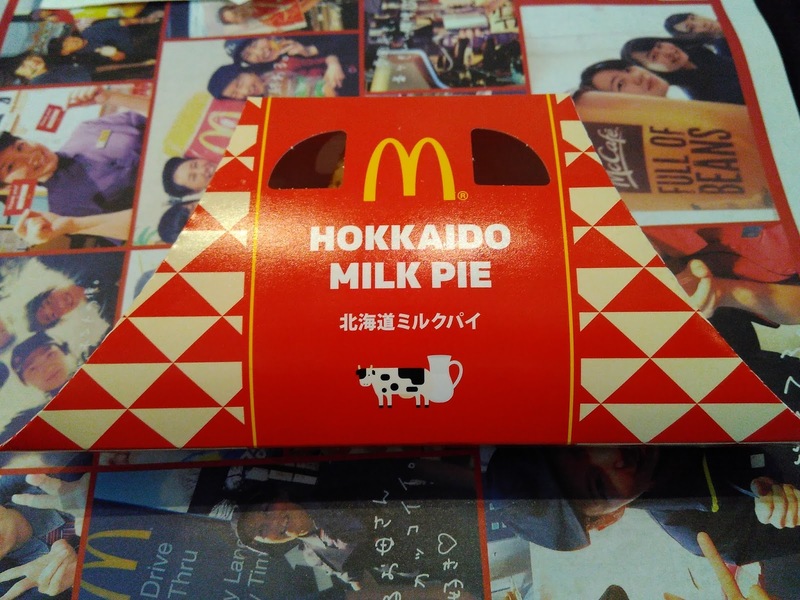 The Milk Pie was the first item released under that banner, and they've since bundled all regular menu deserts like Apple Pies and Oreo McFlurries under the By McSweets banner. A couple things about this pie stood out for me, the first was the shape, as it's been a long time since I've had a triangle pie at McDonald's. 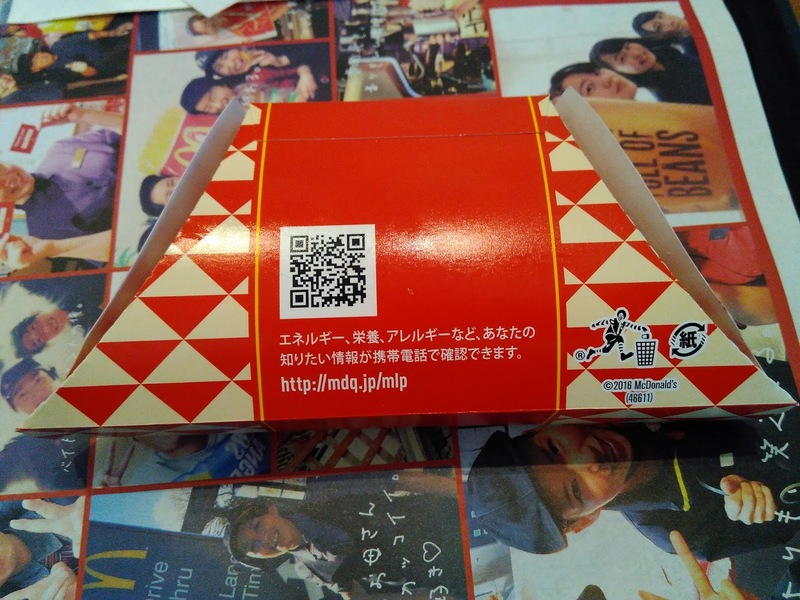 Promo Pies in Japan and Korea used to always be triangle shaped, but since starting the blog in 2012 they haven't had too many, and when they did, I always seemed to miss my chance to have them. The triangle pie crust was similar to the Cream Stew Pie I had in Japan back in February, whereas rather than the tough standard McDonald's Pie crust, this was soft and flaky, in fact it was so flaky that after a single bite I was covered, face, hands and lap with pieces of pie crust. 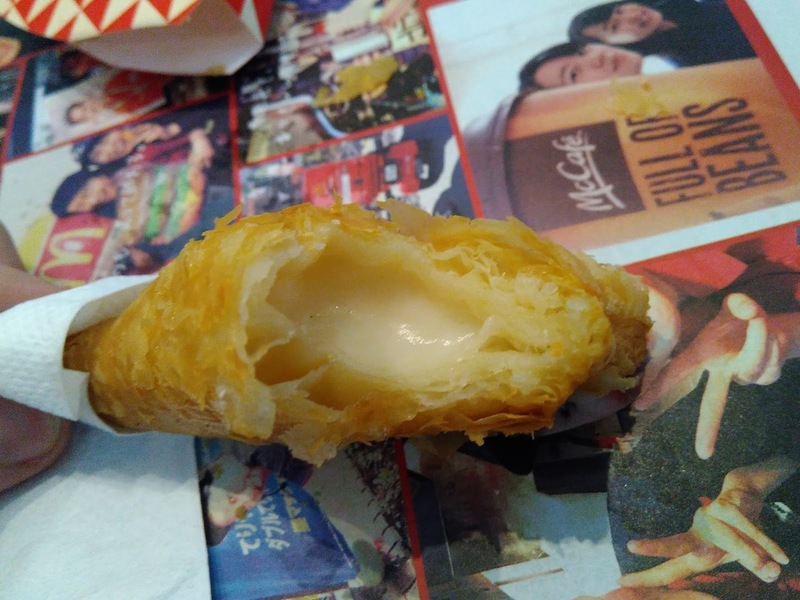 Just look at how flaky that crust is! 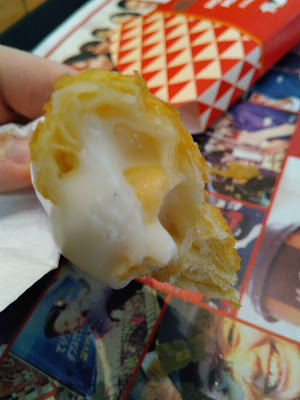 The filling was a sweetened, condensed milk filling. 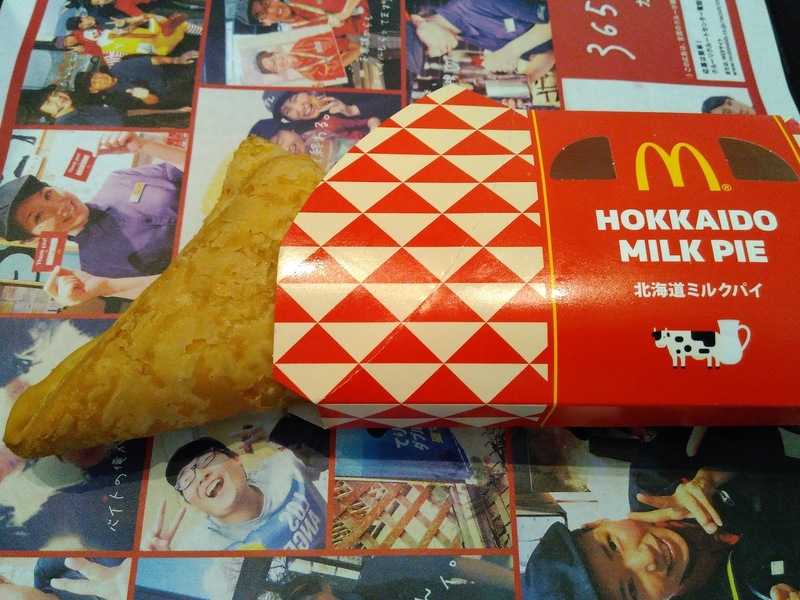 Like the recent Hokkaido Burger, the milk was actually sourced from the island of Hokkaido in Japan, which is known (and I can attest) for having great baked goods and creamy milk. The milk filling was thick and heavy, and although you could tell it was sweetened, it really didn't taste like they filled it with unnecessary sugar just to bulk it out. It looked and had the consistency of icing, but it tasted more like heavy cream. 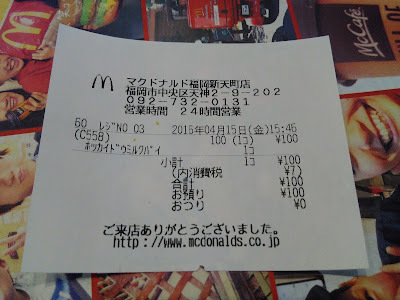 Savoury pies aside, this had to have been the least sweet desert pie I've ever had at McDonald's. They also didn't skimp on the amount of filling either, although my photos make it look like it, the centre of the pie held a nice amount of filling. 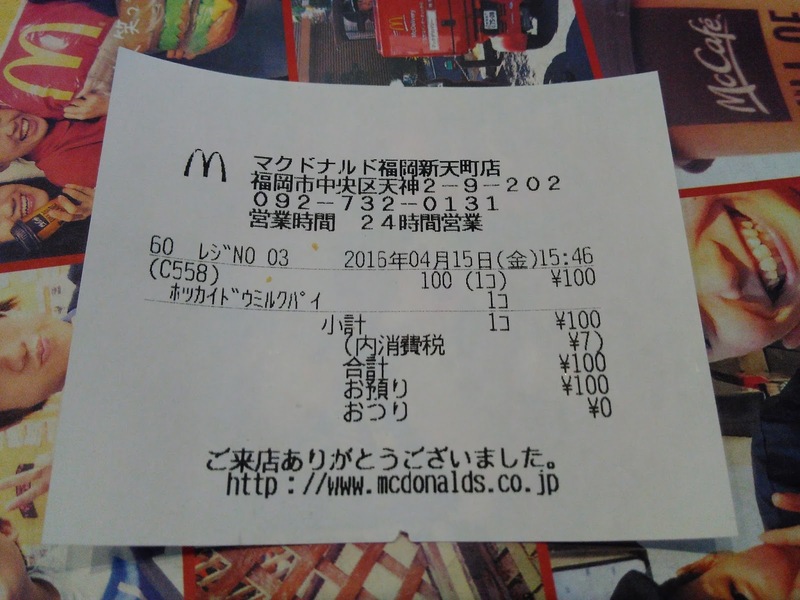 Although what it lacked in sweetness, it made up for in oil surprisingly enough. My pie was served very hot, but it didn't seem like it was out-of-the-fryer fresh, which meant it was probably been sitting under a heat lamp for a while. Normally that would be OK as McDonald's Pies are typically cooked in batches and kept warn, except that each "corner" of the pie ended up being very oily and therefore a bit chewy. As the milk filling was only in the dead centre of the pie this meant that about 2-3cm extending from each corner was without filling. 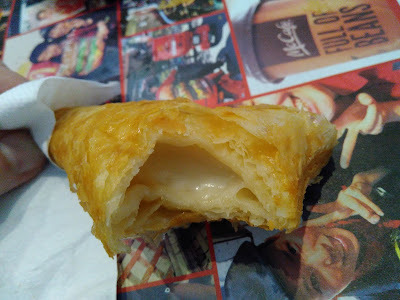 Each corner 'bite' meant that I was not getting any filling in that bite, so it was 100% plain (and oily) pastry which although wasn't terrible, certainly wasn't pleasant either. Once I made it down to the final corner and had finished all the filling, I threw the final bite away. 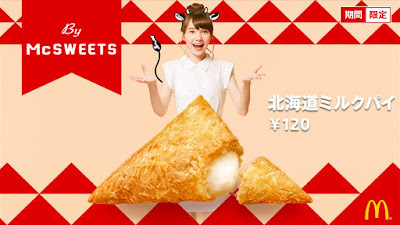 It also wouldn't be Japan without a crazy, completely irrelevant commercial. Enjoy it before it's taken down!